For sake of simplicity, “Town” can mean any settlement, city or metropolis. Catan Horror functions mainly as Settlers of Catan, with the added monsters from Arkham Horror. However, there are several game mechanics which are removed from Settlers of Catan, while playing Arkham Horror. There is no barbarian invasion from Cities and Knights. Remove the barbarian advancement tile from the game. However, the invasion die must still be rolled to determine when the players can draw production cards. Knights can not be built by spending a wool and an ore, they can only be recruited. Knights never have to be activated, so there is no cause to spend a wheat to ‘activate’ any knights. Special Building Phase is always available to the players, regardless of the number of players playing the game. This means any player may build (but not trade nor use Knight Actions) during the Wrap Up of each other player. Note this means that promoting a knight is possible during Special Building Phase, but recruiting a new knight is not. The game is played on the Catan board, which is set up like normal. If there are extra terrain hexes available, play without a desert. Otherwise, play with the desert as normal. Remove any 2s and 12s available from the production chits. Replace them with any other random number, except 6 or 8. If extra production chits are not available, use some other marker to indicate the production value of that hex. Each player places a settlement and a road then a city and a road , as per normal Settlers of Catan rules. The game starts with 2 open gates. After all towns are placed, roll both die, re-roll on 2, 6, 7, 8 or 12. The resulting number indicates where the first gate opens. During the initial setup, no gates will open on a 6 or an 8, but gates can open on those numbers later during the game. If there a multiple production chits showing the resulting number, determine randomly where the gate starts. Repeat the process to determine the location of the second gate. Once the towns, roads and gate are all in place, players draw starting resources from their city and place a Basic Knight unhidden on their city. Players also get a free city wall for their city. Players do not draw resources from hexes covered with a gate. After that, 1 monster is placed at each open gate. 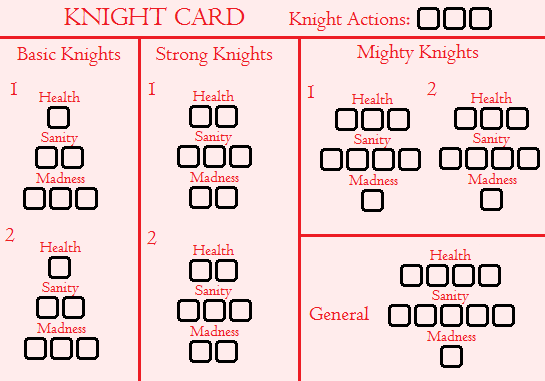 It is required for players create a Knight card (or use the sample provided) to keep track of all their knights. Since each knight has separate Health, Sanity and Madness it can be difficult to keep record of everything accurately. It is further recommended players mark their knights of the same rank to differentiate between the two of the same rank. This can be done with a piece of removable tape or a marker for a more permanent solution. It is up to the players how they would like to handle this. Each game turn is comprised of the player’s turn first, then a monster turn, then a wrap up. Any monsters in the same location as unhidden Active Knights go through combat during this phase. Hidden Knights must make a Hide check or be found and combat begins. Any monsters which are assaulting a city make their attacks during this step. The Production Roll for gathering resources is as normal. However, any town currently Invaded does not draw resources. Building and Trading works normally. Players can buy and trade with other players as often as they’d like during their turn. Players are allowed to trade, build and use their knights in any order and as often as they have the capacity to do so. Each player only has 3 Actions to use among all of his knights combined. Roads are not under the control of any one player. They benefit all players and any player may use any other player’s roads as though they were their own. This counts for production cards like Diplomacy, as well. Because of the potential to have settlements destroyed, it is possible for players to have roads with nothing connected to them. In this case, players can no build any new settlements on that road segment. For a player to build anything, the location of the build must be connected to one of that players sane towns, via any players’ roads. Basic Knights can not be bought. They can only be acquired by Recruiting or Militia. Knights are still promoted by spending a wool and an ore.
Each turn a player gets to take a total of 3 Knight Actions, they can be split up however they want, among as many or few knights as the player wishes. Knights may take the same action multiple times a turn, assuming the player has enough Knight Actions. Knights to do not have to be activated to take actions. In fact, knights can not be “Active” or “Inactive” at all; They are always “active”. A knight may take the Move action and move a number of intersections equal to his strength. A knight’s movement is not restricted to roads. If the knight is unhidden, he can move one further intersection. Movement along a road counts as 1/2 of an intersection for purposes of how far a knight can move. A knight with 1/2 of an intersection of movement left can not move along a border with no road. Roads are not strictly controlled by any one player. Therefore knights can move freely over any players roads. A knight does not have to use all of his movement in one Knight Action, but a player can not move one knight some of that knight’s movement, then take another Knight Action, then use the remainder of the first knight’s movement. Knights can move over and through opposing knights and may even share locations. Knights can not displace opposing knights. Attempting to move out of the same location as a monster requires a Hide check, as detailed below. This does not cause the knight to become hidden. It only allows him to move away from his current location. Failure means the knight is being pursued by the monster and is making no progress. All his movement from that Knight Action is wasted, but he may try again by using another Knight Action. Knights in the same location as Evasive monsters do not have to make a Hide check to avoid that monster. A Knight may initiate combat with any monster in his location. Initiating combat gives the Knight the advantage that he attacks first. Otherwise, the monster attacks first. Additionally, anytime any knight takes the attack action, he is always guaranteed at least one attack die during combat, regardless of the difference in combat strength between himself and the monster. A knight may use an action to calm a town down from a maddening ordeal. A number of Horror damage is removed from the town, equal to the knight’s strength. A knight can not Calm an Invaded town. A knight may use an action to rebuild a town after it has begun to fall apart. A number of Structural damage is removed from the town, equal to the knight’s strength. A knight can not Repair an Invaded town. A knight may take the Raze action to deal Structural damage to the town he is in, equal to his Strength. This can be used to destroy Mad cities, keep a Structurally damaged town from going Mad by destroying it before it does (the lesser of two evils, most of the time) or to attack another player’s town (for any reason). To Raze a Mad town or a town of an opposing color, a knight must make a Raze check, as described below. Sane towns of the player’s own color do not put up a fight. To perform the Raze action on a town, a knight rolls a die, adding his strength to the roll, and subtracting from the roll based on the size of the town. Subtract 1 for a settlement, subtract 2 for a city and subtract 4 for a metropolis. A knight must get a result of 5 or greater on the Raze check to perform the Raze action. If the knight succeeds, he deals his Strength in Structural damage to the Mad town. If the knight fails the Raze check, the mad citizens are stopping the knight at every turn and no damage is dealt to the town, and the Action is wasted. At the start of each turn or whenever attempting to move out of an intersection with a monster, a knight may take the Hide action to hide form the monster and avoid combat, First make a Hide check, as detailed below. If the knight succeeds, flip him to the black and white side. While hiding takes a knight’s action for the turn, becoming unhidden does not take an action and can be done at any point during the controlling player’s turn. This does not apply to Evasive monsters. Evasive monsters have to be found before they can be fought. The same method knights use to Hide is used to find Evasive monsters. While hidden, a knight loses the extra movement bonus that comes with being unhidden, however he is less exposed to the monsters. If a knight is hidden while in a town with a monster or in the same location as a monster, he must make an Hide check, succeeding on a 5 or 6, if he wishes to avoid the monster. He adds his strength to the roll and applying the monster’s awareness So a Basic Knight (1 Strength) hiding from a Byakhee (-2 Awareness) would have a -1 Hide modifier. He still needs a 5+ to hide successfully, so he needs to roll a 6. Failure indicates he is found and combat begins. If any Knight is found, other Knights within the city or same intersection can immediately join the combat, if they wish. Any Knights in combat are immediately unhidden. Hide checks made in any town (Sane, Invaded or Mad, of the same color or not) grant a +1 bonus to the knight’s Hide check, thanks to the cover the buildings provide. A Knight who is at least Strong can Recruit from any Sane town of his color. The player puts a Basic Knight (and only ever a Basic Knight) into play in the same location as the Knight who took the Recruit action. Only one Knight can be Recruited from each town, each turn. The new recruited Basic Knight appears at the end of the player’s turn. A Strong or Mighty Knight may form a squad with any other weaker Knights in his location and of the same color. Knights can not form squads with Knights of an opposing color. Once a squad is formed, other knights may join it by using the Join Squad Knight Action. While in a squad, the whole squad works together to perform any action using only 1 Knight Action. Therefore, with only 1 Knight Action, the whole squad can be made to move. However, the squad moves only as fast as its weakest member. Similarly for Hide checks, although the strongest knight is used as the squad’s modifier. Although, for any other strength based Knight Action, the strength of all Knights in the squad are added together. A squad of 1 Strong Knight (2 Strength) and 2 basic knight (each 1 Strength) could Raze a town and deal 4 damage to it. Once a squad is formed, it can not be disbanded. Only when a knight dies is it removed from the squad. When assigning damage to a squad, the lowest rank knights must be killed first. The stronger knights can take damage, but they can not be killed before the weaker ones. Any action that can be taken by a single Knight, can also be performed by a Squad. However, if any rule or Action specifically states the strength of the knight with a rank (Basic, Strong, Mighty) a squad can only perform that action if they have a knight of that strength within the squad. If an Action states the required strength as a number (“A knight with strength 3 or greater…”) the squad only needs to have that much strength, regardless of actual rank. When in combat, squads get a bonus to their combat strength equal to the number of members in the group. If a member of a squad is killed or goes Mad, he is immediately removed from the squad. A knight which has sustained damage and survived may spend a Knight Action to remove 1 damage and 1 sanity. If part of a squad, only 1 member gets to restore his health and sanity with each Rest action. The player must spend 1 wheat each time this Knight Action is taken by his knights. A player may spend two Actions to have his knights Harvest with a Knight Action. A knight may harvest resources from any hex to which he is adjacent. If the strength of the knight is 3 or greater, the Harvest action draws two resources. The two resources drawn do not have to be from the same hex. For example, a Mighty Knight could use the Harvest action to draw a lumber and a grain, assuming he was adjacent to a mountain hex and a field hex. Any player (even one with no knights) may spend 3 Knight Actions to enact a militia. This places a single Basic Knight (and only ever a basic knight) in any non-Mad town of the player’s choice that he controls. Those knights gained through Militia appear at the very end of the player’s turn. If the player has no remaining Basic knight tokens, he may not enact a militia. A player may use 3 Knight Actions, demote a knight (or remove that knight from the board if it is a Basic Knight) and pay the cost of a settlement to colonize at that knight’s location. The player places a settlement in the same location as the knight which performed the Colonize action. The new settlement does not have to be connected to any of the player’s roads, but must still adhere to the proximity rule of no towns may be within 2 intersections of each other. Knights take Sanity damage each turn they remain in a Mad or Invaded town. Each knight can take 1 more than his strength in Sanity damage before going Mad. Once a knight goes Mad, he is treated as a monster for a set duration, at which point his mind returns to normal, clear of any madness. A knight goes mad for a number of turns equal to 5 minus his strength. So Basic knights can take 2 Sanity damage and go Mad for 3 turns. Strong knights can take 3 Sanity damage and go Mad for 2 turns. Mighty knights can take 4 Sanity damage and go Mad for 1 turns and Generals can take 5 Sanity damage and also only go Mad for 1 turn. Once a knight has taken enough Sanity damage, he immediately goes Mad and is counted as a monster. He joins in any attacks on nearby cities or knights as a normal monster would. He is considered a monster with combat rating and damage rating equal to his strength. His Horror damage is 1. He has normal monster movement and an Awareness of +0. Mad knights will attack sane knights in his same location during the next combat phase. Knights which are part of a squad that go Mad will break off of the squad and are removed from it. Towards the end of each turn, his madness slowly wanes. It should be noted on the player’s Knight Card how many turns have gone by and how close the knight is to regaining his sanity. Once a knight throws off his madness, all Sanity damage is removed. On the following turn he will be able to be used again as normal. A hex with a gate on it does not produce any resources, much like if the robber were placed on it. Each time a 2 or a 12 is rolled during production, a new gate has the potential to open. After the 2 or 12 is rolled, re-roll the dice. The result indicates where the new gate opens. Randomly draw a gate token and place it over the production chit. If there are multiple production chits with the number shown, determine randomly at which hex the gate opens. If there are no numbers on the board showing that number, a monster surge occurs. Hexes already covered by a gate are not considered when opening a new gate. Therefore a monster surge will only appear after each chit of a certain number is covered with a gate. When a monster surge occurs, a monster appears at each open gate. Each time a new gate opens, a new monster appears at that gate. When a monster appears from a gate, it is left on the center of the hex until it moves. When determining where the monster moves, it is considered to be on every intersection of that hex. So, the monster would be able to see every city 2 intersections away from that hex, because a city has Illumination of 2. To close a gate requires knights to take the Attack Knight Action. Only one knight (or squad) attacks for each Attack action. Each gate can take 10 damage before closing. The knight deals damage equal to his strength minus the gate’s difficulty rating. In this instance, some gates will add to the amount of damage they take with each attack. Gates can accumulate damage over several turns. When a gate is closed, it is removed from the board and placed back into the gate token draw pile. A gate closing has no bearing on the monsters of the same gate symbol on the board. Immediately when a gate is closed, and not any point after, the player who closed the gate may spend a clue token to seal the gate. Place an elder sign token next to the production chit. No gates may open on the hex for the remainder of the game. Each Monster Move phase, each monster has the potential to move. For each monster, roll a die. On a 4+, the monster moves. Otherwise, it does not. Red bordered monsters (Fast monsters) move on a 3+. Yellow bordered monsters (stationary monsters) never move. When determining where and how a monster moves, it is important to know what it can see. Settlements have an Illumination of 1, Cities have an Illumination of 2, Metropolises have an Illumination of 3. If a monster is within an a number of intersections of any town’s Illumination, when that monster moves, it will move towards that town. Monsters will go for the closest town first, or smallest sized town if several are the same distance away. If all other things are the same, determine randomly towards which town the monster moves. A monster will never choose to move toward a Mad town and ignores them completely. It is possible for a monster to move towards a city or metropolis and, in moving towards it, will see a smaller town. The monster will then move towards the smaller town the next time it moves. If there is no town in sight and a monster is in an adjacent location to an unhidden knight, the monster moves to the town or knight. If a turn starts with a monster in the same intersection as a hidden knight, the knight must make a Hide check or fight the monster. Monsters always favor chasing towns over chasing knights if both are in view. If there are no towns or knights in sight, monsters will move randomly. Monsters move one intersection in a random direction. Each time a monster has to move randomly, number the three intersection boundaries to which the monster is adjacent, numbering one of them with 1-2, the next with 3-4 and the last with 5-6 and roll a die. The monster moves along that intersection boundary. Fast monsters (red border) move two intersections each time they move. When moving randomly, roll for each intersection moved. Flying (Blue border) can move over water freely (see Adding Expansions in the Appendix) and always move to the closest (or then smallest) town, regardless if that town’s Illumination. Aquatic monsters (Orange border) can also move over water freely, but otherwise move normally. Stationary monsters (Yellow border) never leave the location they are created in. Stalker monsters (Purple border) always move to the closest Knight and are always aware of where the closest knight is. Monsters with special movement (Green border) are often best to be discarded and a new monster put in its place, but some work well. See Special Movement Monsters in the Appendix. When determining if a move is closer to a monster’s target. Count the number of intersections between the monster and ts target. If the move reduces the amount of intersections between the monster and its target, the move brings it closer. If the amount stays the same, the move is not closer to the target. At a certain point of taking too much damage, a town will go Mad or fall. Each level of town can take different amount of damage before sustaining any penalties. A settlement can take a total of 5 damage before it becomes Mad or falls. When a city takes 10 Horror damage, it goes Mad. When it takes 10 Structural damage, it is reduced to a settlement and 10 Structural damage is removed. A metropolis can take 20 Horror damage before it goes Mad, but at 15 Structural damage, it is reduced to a city and 15 Structural damage is removed. Mark a town as Mad on the town card. When a town goes Mad, any Structural damage it has sustained remains until Repaired or Razed further. If a town is ever demoted and the amount of Horror damage it has is now over the limit of its new demoted Horror damage limit, it immediately goes Mad. A Metropolis which is reduced to a city can be rebuilt by any player by spending 4 of the appropriate commodity, or 5 of the commodity if the last city improvement has been built by the player controlling that Metropolis. Once a monster has caused a town to become Mad or Fall, it ignores the town and finds new targets, moving as normal. A Mad town must be destroyed to stop its production of monsters. Once a town becomes Mad, it is beyond saving. Knights must use the Raze action while in the Mad town to destroy it. However, the citizens of the down will resist the knight’s attempt and the knight must make a Raze check. Any and all knights who end their turn in a Mad town take 1 Sanity damage. If a squad is present in an Invaded or Mad town, each knight in the squad takes 1 Sanity damage. This should be noted on his Knight Card. At the end of each turn, each Mad town rolls a die. If that settlement rolls a 5+, they produce a random monster. If a Mad city rolls a 4+, they produce a random monster, redrawing if the monster’s toughness is less than 2. If a Mad Metropolis rolls a 2+, they produce a random monster, redrawing if the monster’s toughness is less than 3. Combat is done similar to the rules for Arkham Horror. The combat strength of the knights is compared to the combat strength of the monsters. The resulting difference shows how many die the player gets to roll. For every 5 or 6 shown, a hit is scored by the knights. Combat strength of the knights is their knight strength. Basic knights have 1 combat strength, Strong knights have 2 and Mighty knights have 3. Combat strength for monsters is equal to their combat damage (the number of heart icons in the lower right). The Horror damage for monsters is shown by the number of blue circles in the lower left of the monster tile. The combat and sanity ratings (the red and blue numbers) are not used in Catan Horror and can be ignored. Monsters have health equal to their toughness (the blood drop icons in the bottom center). When combat begins, only the current player’s knights will engage in combat. All knights in the same location as a monster will enter combat. As soon as this happens, the player has several options. If a knight is already hidden, he can make a Hide check to avoid combat. If a knight is not already hidden, he can not hide now. Each knight who enters a fight can band together with every other knight in his location to combine their combat strength. A Knight who uses the Attack action rolls his attack first, with other knights in his location. Otherwise, the monsters get the first attack. Evasive monsters are not counted for this unless they have been forced into combat by being found with a Hide check. Every combat, every monster will make an attack individually. Monsters automatically deal damage each time they attack. Monsters deal damage to the knights in the same location as them equal to their combat strength. Monsters do not ‘spill over’ extra damage from dead knights onto others. If a monster with 4 combat strength kills a Basic knight, 1 damage is dealt to the Basic knight (which kills him) and the remaining 3 damage is not dealt to any target. In some cases, it is advantageous to the player to ‘sacrifice’ their weaker knights to save their stronger ones. Damage is distributed among the available knights in the combat, as the current player decides. Note rules for dealing damage to a squad are different, as listed in the Form Squad section above. Knights do not take Sanity damage from combat. When knights attack, they get to choose which monsters to fight. If multiple monsters are in the same location, the player must choose which monsters to have his knights engage before rolling, even if those monsters already got an attack on the knights. The combat strength of the monster is subtracted from the combat strength of the knights to determine how many die the player may roll for their attack. For example, a Basic knight and a Strong knight are in the same location as a monster with 2 combat strength. The knights have a combined combat strength of 3 (Basic has 1, Strong has 2). The combat strength of the monster is subtracted from his, resulting in 1. So, the player gets to roll 1 die. On a 5 or a 6, the knights score a hit on the monster and deal 1 damage to it. If a monster is immune to a certain weapon type, knights using that weapon count for 0 strength. If a monster has a certain resistance to a weapon type, that knight is counted as having half of his actual strength. When determining the strength of a knight group for combat, add all knight’s strength together (including halves), then round down. Basic Knights only have Physical Weapons. Strong Knights only have Magic Weapons. Mighty Knights have both and can choose which to use. Only one round of combat is done each turn. The monster gets 1 attack and the knights get 1 attack. When they can take actions, knights are free to run away from a monster as normal, or stay and fight. Squads are much more effective in combat. When attacking, a squad rolls a number of dice equal to their strength (remembering squads get combat bonus equal to the number of members it has). For each monster the squad is fighting, they may choose which dice are lost to that monster’s combat strength and may use the resulting dice to determine their damage dealt to that monster. Squads to not have to decide which monsters to engage before making their attack roll. Knights can assign any dice they would like towards overcoming the monster’s combat strength. For example, a squad of 2 Basic knights, 1 Strong knight and 1 Might knight (combat strength of 10, 7 knight strength plus 3 bonus squad strength) are in the same location as 3 monsters both with 2 combat strength and 2 health. The knights roll 7 dice and get 6, 6, 5, 5, 5, 4, 4, 3, 2, 1. The knights attack the first monster and assign the dice showing 1 and 2 to overcome the monster’s combat strength. Then they use both 6s to damage the monster, killing it. Then they use the 3 and one of the 4s to overcome the combat strength of the second monster and two of the 5s to kill it. The remaining die show 4 and 5. The knights do not have enough die to overcome the last monster’s combat strength to be able to damage it. So the knights attack ends. Immediately when a knight accumulates damage equal to his strength, he is demoted to the next lowest strength and removes a number of damage tokens equal to his original strength as he is being demoted. A basic knight dies if it is ever damaged. Players can not assign more damage to a knight than he has strength combined through his demotions. So a Basic knight can not be assigned to take more than 1 damage. A Strong knight can not be assigned to take more than 3 damage at once and a Mighty knight can not be assigned to take more than 6 damage at once. If a knight is demoted to a rank of which the player has no more tokens, that knight is killed instead of demoted. At the start of each turn, monsters which are in the same location as a Sane town with defenses have to first defeat any and all defenses. Defenses include knights and city walls. During this time, the monster is considered to be ‘assaulting’ the town. It has not gotten into the town yet, but if it does, the town is considered ‘invaded’. During this time, the monster is running amok, destroying buildings and spreading insanity. As soon as a monster enters the same location as a town, each knight in that location must choose how to respond. Either stay and fight, stay and hide or flee. A knight who chooses to stay to fight will enter combat as normal. A knight who chooses to stay and Hide, remains in the town, but must make a Hide check as soon as the monster invades the city, entering combat with the monster if he is found. A knight who chooses to flee moves to any adjacent intersection to the town. Any knights defending a town from a monster assault get one attack per turn, as normal. While combating a monster assaulting a town they are in, knights score a hit on a 4+. While in an Invaded or Mad town, knights hit on a 5+, as normal. Each turn while a town is being assaulted by a monster with Nightmarish or Overwhelming, it takes Horror damage (or Structural damage) equal to the Nightmarish damage (or Overwhelming damage), even though it has not yet Invaded the town. City walls can be sacrificed to negate an attack from 1 monster. The player who controls the town gets to decide which monster’s attack is canceled. City walls can not be discarded to prevent nightmarish or overwhelming damage. If no other defenses are present when the city takes any Structural damage, the city wall must be sacrificed. If a monster gets to a town without any defenses, or defeats all the defenses, the monster has Invaded the town. When a monster has Invaded a town, the citizens of that town are overwhelmed with madness and can not produce resources and do not count for victory points. The town is no longer considered to be owned or controlled by the player. Each turn a monster is invading a town, that town takes Horror damage equal to the monster’s horror rating and Structural damage equal to the monster’s combat damage. Mark a town as Invaded on its Town card. Knights can attack monsters in an Invaded town in an attempt to restore it to how it was. At the end of each turn, any and all knights within an Invaded or Mad town take 1 Sanity damage. If a squad is present in an Invaded or Mad town, each knight in the squad takes 1 Sanity damage. This should be noted on his Knight Card. By defeating all monsters in an Invaded town, the town is no longer Invaded. However, any Horror and Structural damage it has sustained remain. A knight who moves into an Invaded town may either take a Knight Action to Hide within the town and do nothing, waiting for more knights, or he may Attack the monster. Note any Hide checks made within a town grant a +1 bonus to the knight’s Hide check. If the Knight Attacks, any other Knights within the town may join the combat immediately. Combat goes as normal, noting that the knights only hit on a 5+, since the town is now Invaded. If a player has all of their towns and knights become Mad, they themselves become Mad. Mad players work against the remaining sane players. Any other Mad towns on the board are replaced by the newly Mad player’s color. If that player does not have enough settlement or city pieces, the player decides which towns to gain control of and the remaining towns function typically as Mad towns. Mad players can not trade with sane players, but they may always trade to the bank at a 3:1 rate, following the same rules as a harbor, although it does not count as a harbor. Mad players control the monsters during their movement steps and can choose to ignore the typical rules for monster movement. A Mad players knights become Mad. However, as they function as monsters while Mad, they are still under the control of the Mad Player and can be fully controlled in this state. Anytime a monster kills a sane knight, the Mad player draws 1 resource from the hand of the player who controlled the recently killed knight. Anytime a monster destroys a settlement, the Mad player draws any 2 resources from the bank. Anytime a 2 or a 12 is rolled, the Mad player rolls both die and can choose where, of the available hexes, to place the gate. The Mad player may spend 1 wheat to reroll the die to determine where the gate could be placed. The Mad player can only do this once per gate placement. Mad Players can build monsters as they would build anything else. Whenever a mad player controlled town has nothing being built within it, the player may take a random monster from the cup and place it on the town card for that town. Each town can have 1 monster being built in it. Monsters can take several turns to build. Each monster takes more time and resources to build for each point of health it has. Mad players must spend 2 sheep, 1 wheat and 1 lumber to add to the monster’s build. Once a monster has been built towards a number of times equal to it’s health, it is completed and is placed on the board in the location it was built during the Monster Production step. Once more than one player has become Mad, the Mad players divide their Mad towns evenly among each other, replacing settlement and city pieces on the board, if need be. The Mad players may decide together how to divide the towns. Once there are multiple Mad players, they may not trade to the bank at a 3:1 rate anymore, but they may trade with one another. They still may not trade with any sane players. Mad Players can not win from gaining the required number of Victory Points. Mad players can only win by wiping the other players off the map. Mad players win or lose as a team. Optionally, the players may decide to start the game with a Mad player. This should be decided before the game begins. The players can choose to decide which player begins Mad randomly, or one player may choose to start the game Mad. It is suggested to start with only a single Mad player, but not a requirement. Optionally, the players can allow a player who has been wiped out to become Mad, instead. If a player loses all of their towns and knights, rather than stop playing, they can become a Mad player instead. If a Mad player causes a sane player to be wiped out, it is recommended that the player does not become Mad and is removed from the game. Because of this, Mad players will have to use some strategy in maddening sane players towns before destroying them. During any point when a player could normally build, they may spend 5 toughness worth of monster trophies for a clue token. Clue tokens may be spent to gain an extra knight action or to seal gates. Clue tokens and monster trophies may not be bought nor traded. While making any sort of check, a player may spend a monster trophy to gain a bonus to the roll equal to the monster’s toughness. Any progress or development card that does nothing but grant a player a victory point can be discarded (and not available to be redrawn for the remainder of the game) for a General. This special unit functions as a Knight with strength of 4, but functions as a Mighty knight for all other purposes. It should be represented with a Mighty knight piece, but with an extra marker to note its difference. Players can not have more than one General, nor can they have a General and two Mighty Knights. Players can not gain a General without the Fortress city improvement. Players can gain a General regardless of the knights they do or do not control at the time. The General can be placed on any sane city of the player’s color. If a player loses control of all his towns and knights, he is dead and no longer playing. He can not be traded with and can not buy or sell anything. He is lo longer considered in the game. If the remaining players win after his defeat, they are the winners, but he is not. If a single player has more than 10 Victory Points at any point during his turn, he has discovered a way to defeat the monsters once and for all, but must let his fellow Settlers fall in the process. This player is the sole winner. If every town becomes Mad, Catan has fallen to the Ancient Ones and the rest of the world is not far from falling as well. If all Mad towns are destroyed, all gates closed and all monsters killed, Catan is free of the horrors which had plagued it and all the Settlers win. 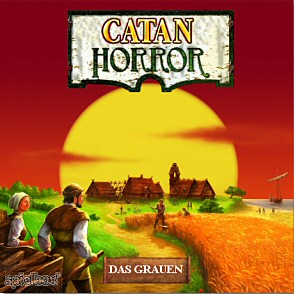 It is possible to combine the base Catan Horror with the other expansions from both Settlers of Catan and Arkham Horror. Some blend well with the base game, others do not. Seafarers and the Rivers variant from Traders and Barbarians would blend well enough with the base game. However, it is highly recommended, if playing with multiple islands to ensure the two starting gates are not on the same island. If playing with Rivers, un-bridged river borders slow down monster movement. Any non-flying or non-aquatic monster requires twice as long to cross a river. If a normal monster attempts to cross a river, place it half way across (in the middle of the border section), then next turn move it the remainder of the way. Fast monsters can also cross rivers in one turn, but only if they start their turn adjacent to it since it still requires them twice as much movement to cross it. In Seafarers, monsters can move across shipping lines. If a monster moves across a shipping line by either seeing a town across the water or by moving randomly, he continues to move in that direction until he reaches the other side. The monster is stowing away on board the ship and can not turn around mid journey. Movement at any splits in the shipping line would be determined as normal by looking for towns in the distance then knights, then randomly. The monster will still never backtrack over a shipping line he has already taken, even by moving randomly at a junction. Arkham Horror expansions don’t blend as well as Settlers of Catan expansions do, mainly because the game is mostly Catan with elements of Arkahm Horror. Out of all the possible expansions which could be added, most would require too large of a rule change or doesn’t provide enough of a change to make the addition worth it. There are monsters in Arkham Horror which have a special movement method. This is noted by a green border. It is recommended if one of these monsters is drawn that it be discarded and a new random monster drawn instead. Addition (or not) of these monsters should be agreed upon by all players at the start of the game. – Gates can’t start on 6 or 8. – Remove 2 and 12 production chits. Gates open on 2 and 12. – Players start with city wall. – Knights can not Calm or Repair Invaded towns. + Wheat required for Rest Knight Action. I changed some stuff around to make it better to defend against monsters over trying to drive them out of a town. Bonuses to Hide in towns and bonuses to attack towns you’re defending try and focus on that idea. The Knight Card I made in MS Paint. It’s not by any means a quality piece of engineering. It’s just how I envisioned the cards to lay out. I still haven’t gotten a chance to playtest this. For two reasons, I recently moved and have only been to my LGS once since settling in. And two, I gave away my copy of Arkham Horror. Both of those things vastly impede my ability to play Catan Horror. I want to thank Tom who commented on this post recently and revived my interest in getting it playable. Also for a number (I assume) of his great ideas. I did not realize how poorly some of these rules were written and laid out. I really tried to give it a nice shine this time around. A lot of the rules were clarified, edited or straight up removed. I added a lot of new elements as well. NEVER use the text highlight feature on Blogger. It was only ruin your day (and your posts). I am baffled at how badly this post was messed up before I could manage to post it again. It somehow got all scrambled up. Certain sections where completely misplaced in other sections. It was mind-boggling. I thought about letting knights go mad and they go spread madness and stuff, like Panic and Raze… but I figured they would basically just become monsters at that point. Plus, it’s just an extra complication that the game didn’t need. If you want to enact some rule like that and get it working well, I’d really love to hear about it. I wasn’t sure about letting knight’s heal with the Rest action. I can see it being abused with squads of a mighty and strong knights, all the damage going onto the mighty knight, then resting up for a few turns to heal. But, I figure that’s kinda the point. That’s a tough squad, they should be able to take some heavy punishment. Also, I’m aware that the flow of this is kinda jumpy. I reference things I don’t mention until way later in the post, but there’s not a lot I can do about that. Just figured I’d mention it. Also also, as of now, this hasn’t been play-tested at all. So expect heavy changes pretty soon after the first play through. As I mentioned, I haven’t play-tested this yet, but I haven’t posted in so long, I want to post it anyway. I’m thinking there might be some glaring oversights on my part with some of the rules. Primarily in the balance of the game and how things like combat work and how smoothly they work. As of now, the turn order has a single player going through his full turn before moving onto the next player. This might change later to be more like Arkham Horror where the turns are phase based, rather than player based. However, the first player token would be used to indicate the only player with whom others players can currently trade. In the Traders & Barbarians Catan Expansion, there is the opportunity for players to use Event cards in lieu of die for determining production rolls. These cards also add an random element to the game by adding random events to the game, effecting the players when the card is drawn. Rather than have the General just be a stronger knight, he may gain additional abilities. There would be a list to choose from and the players would be allowed to choose the ability upon the time of creation of the General. They’d also be able to change the ability by spending another victory point card or maybe just a clue token. I played with the idea of having a Mad settlement eventually grow into a Mad city, but considering it would require a player to give up a city piece, I didn’t think it would be playable without sacrificing either a a player’s city piece or setting aside an entire color just for Mad towns. This entry was posted in arkham, catan, combination, settlers. Bookmark the permalink. What if the knights just go Mad for a round or so, and then get demoted? After players make their first city placements, randomly determine two production hexes to have open gates. Each gate gets a monster and the token sits on top of the number token blocking production until the gate is sealed. Then players place their second city and road. Everytime you would normally gain a progress card you can decide to gain a clue token instead. In order to seal a gate you need enter it, defeat a random monster, and then spend a clue token to seal it (taking a total of three knight actions). The potential for MadTowns would still exist, but you would not start with any at the beginning of the game. If you are worried about the Rest action being abused you could require one Wheat to be spent to complete it. That would rebalance the resource usage as well, since activations are no longer in play. Not a bad idea. My first reaction is to say they would go mad for something like 5 turns minus their strength. So weaker knights are more easily maddened while the stronger knights are able to throw it off faster. As you might have gathered, I haven't touched this article in some time. But since apparently people are still looking at it, I'll review it again! Also a good idea. Don't know why I didn't think of it before! It's so simple! You got moxie, kid. I like that. But seriously, great idea. I'm definitely going to give this another read through and add some new ideas and iron out some inconsistencies. Thanks for the input. I'm always glad to know there are people out there still interested in what I have to offer!